Items 127- out of displayed. Turkish Lyra fell sharply on Friday against the USD, but market is now reversing those losses after situation in Turkey calmed down surprisingly very fast. An updated count shows a possibility of a triangle where wave E) is still missing, so make sure not to fall into this bullish sentiment on USDTRY too soon, as we see a possible pullback in play now to around 2.8400 area before real and strong bullish reaction will show up. Crude oil turned nicely down at the start of the month from 51.65 where market completed extended blue wave three, so our wave count suggests that recent bearish structure with three legs is wave four. 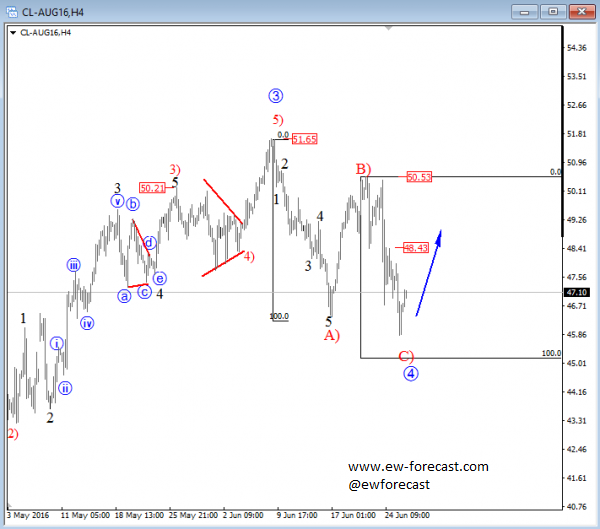 In fact, decline from 50.52, labeled as wave C), already spiked beneath wave A) levels so minimum requirements for a valid correction were met, thus new bullish turn can be around the corner. Rise above 48.43 would suggest that lows are in. Overall, we believe that sooner or later energy will rally back to 51.65 highs. Below it's our video updated on EURUSD from last week when we talked about bearish reversal. In video below you can find our latest views on EURUSD, USD Index, GBPUSD, AUDUSD and GOLD. 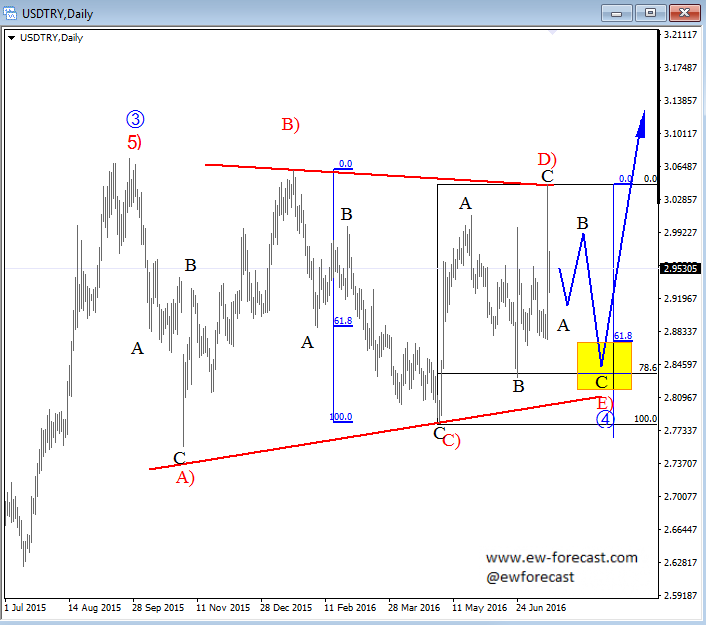 USD Index Bearish Or Bullish ? 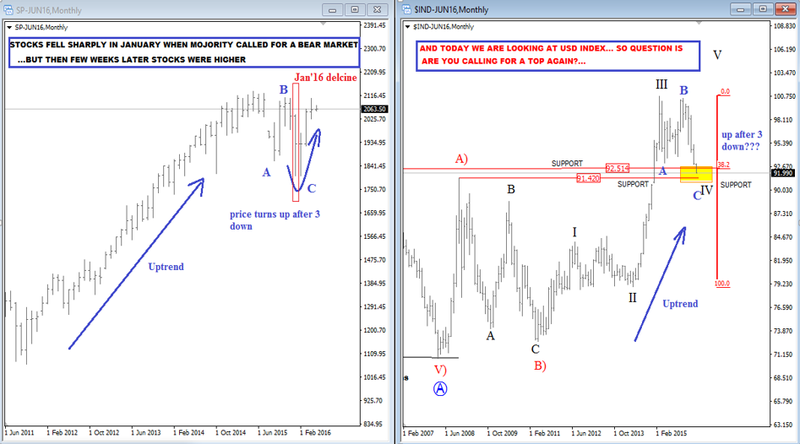 Will USD Index repeat the price action compared to the S&P500 in January 2016 ? Majority turned very bearish on S&P500 back then, but a few weeks later price turned up. Today we see more and more investors and traders looking down on US dollar, so a bounce would not surprise us. USD is up in the last 48 hours against EUR, GBP, CHF and JPY. So what was the catalyst for a turning point? Any fundamental news, events, any speeches, or it was maybe just the "shape and structure of the pattern"? Well, we recognized an ending diagonal; it's the most powerful pattern in Elliott Wave theory, slow move that causes a very strong reversal. With this pattern you can also predict a target as well, not only a direction. Usually price will retrace back to the start point of an ending diagonal which was at 95.05. it was touched this morning. So, did you recognize the pattern on time? Do you know where USD is likely headed from here? 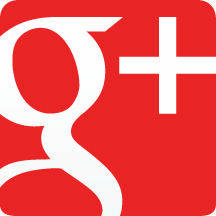 Check our services and get our latest updates today!